Q: When and how did Gabii sa Kabilin start? A: Gabii sa Kabilin started on May 25, 2007 with three Cebu City museums—Casa Gorodo Museum, Cathedral Museum of Cebu, and Basilica del Santo Niño Museum—and one heritage site, Fort San Pedro. In the second Gabii sa Kabilin on May 30, 2008, the Yap-Sandiego Ancestral House joined as a participating museum and Shangri-la Mactan Resort and Spa as a partner. The tartanilla, an icon of Cebu, was also added. In May 29, 2009, the third Gabii sa Kabilin welcomed Museo Sugbo. The fourth Gabii sa Kabilin on May 28 welcomed the 1730 Jesuit House, University of Southern Philippines Foundation (USPF)-Rizaliana Museum, and the Sacred Heart Parish Alternative Contemporary Arts Studio (ACAS). Mandaue City and its plaza is among the participating heritage sites in 2011. Q: When is this year’s Gabii sa Kabilin? A: The 6th Gabii sa Kabilin will be held on May 25, 2012, culminating the International Museum’s Day (May18) and National Heritage Month celebrations in May. Q: What is the concept of Gabii sa Kabilin? What are its goals? A: Inspired by the Lange Nacht der Museen, or Long Night of Museums, in Germany and other European countries, the Gabii sa Kabilin initiated by the Ramon Aboitiz Foundation Inc.(RAFI), which is the only cultural event of its kind in Philippines and Asia, encourages the public to visit museums and understand their position as a venue for cultural understanding and fun and dynamic learning. During the event, museums and cultural institutions remain open until late night for public viewing. Cultural presentations and activities are also offered. Q: How many and what are the participating museums and heritage sites this year? A: This year the heritage event will feature 21 main attractions composed of museums and cultural sites in the cities of Cebu and Mandaue. These are Aboitizland Heritage Pocket, Ayala Center Cebu Cinema and The Terraces, Fo Guang Shan Chu Un Temple, Bank of the Philippine Islands (BPI) Museum, College Assurance Plan (CAP) Theater, Cathedral Museum, Casa Gorordo Museum, Cebu City Museum, Cebu Normal University (CNU), Fort San Pedro, Jose R. Gullas Halad Museum, Mandaue City Plaza, Museo Parian sa Sugbo, Museo Sugbo Complex, Plaza Independencia, Sacred Heart Parish Church and Alternative Contemporary Arts Studio (ACAS), Basilica Minore del Santo Niño through the Santo Niño de Cebu Augustinian Social Development Foundation (SNAF), University of San Carlos Museum, University of Southern Philippines Foundation (USPF) Rizaliana Museum, and Yap- Sandiego Ancestral House. Gabii sa Kabilin’s new participating sites this year are Ayala Center Cebu Cinema and The Terraces, Fo Guang Shan Chu Un Temple, BPI Museum, CAP Theater, JRG Halad Museum, and University of San Carlos Museum. Like in previous Gabii sa Kabilin runs, places of historic and cultural significance within walking distance or along the tour routes are also earmarked. These have also grown in number this year. Some of them are the 1938 VECO Buiding, Asilo de la Milagrosa, Matilda Bradford Church, Cebu Provincial Capitol, Cebu Puericulture and Maternity House, Compania Maritima, early 1900s warehouses along M.C. Briones Street, Fuente Osmeña, Gotiaoco Building, Iglesia Filipina Independiente Cathedral, Malacañang sa Sugbo, Mother of Perpetual Help Parish Church, old Southern Islands Hospital, Plaza Hamabar, the old bridges of Sikatuna and Zulueta Streets, Oriente and Vision Theaters, Plaza Sugbo, Plaza Hamabar, University of the Philippines Cebu College, and Yutivo Building. Q: Who are RAFI’s partners/sponsors for this event this year? A: Implementation of Gabii sa Kabilin is made possible through partnerships with the local government units of Cebu City and Mandaue, Cebu City Traffic Operations Management (CITOM), Philippine National Police–Cebu City (PNP), Cultural and Historical Affairs Commission (CHAC) of Cebu City, Province of Cebu, Department of Tourism–Region VII and Santo Niño de Cebu Augustinian Social Development Foundation (SNAF). Q: What can people expect from this year’s Gabii sa Kabilin? A: Gabii sa Kabilin guests will treated to cultural performances, exhibits, art fairs, food markets, and interactive demonstrations in the 20 main sites. For this year’s Gabii sa Kabilin, there are various suggested routesaccording to specific themes applicable to the museums and heritage sites, which guests can choose from. These themes include Museums; Art Galleries andAlternative Spaces; Heritage Structures; Educational; Churches, Temples, and Sacred Places; and Public Spaces. With one ticket worth PhP150.00, local and foreign tourists will have the freedom to go to as many participating museums and cultural heritage sites within the six hours of the heritage event. The ticket also allows them to take as many rides as they want in Gabii sa Kabilin-designated buses and one tartanilla (horse-drawn carriage) trip in Cebu City’s old district. Q: What are Gabii sa Kabilin’s impact to the Cebuano community? Since Gabii sa Kabilin started, there has been an increased awareness of the public on Cebuano culture and heritage. What’s good is that the youth are also actively joining and even coming up with writeups and blogs about the event. More people are discovering the rich heritage that Cebuanos have. Places of cultural and historic significance that used to be unknown are beginning to be familiar among the Cebuanos. The collaboration among museums, the participation of the barangays, and the support of the public and private sectors have established Gabii sa Kabilin as a venue for strengthening community involvement and multisectoral partnerships. Q: Where and how can people buy tickets? How can they get updates regarding the event? A: Tickets will be sold starting May 10, 2012 at the 22 participating museums and cultural sites, including the concierge at Ayala Center Cebu. Detailed information about the participating sites and their presentations as well as tour routes of Gabii sa Kabilin will be available for download also on May 10, 2012 at www.rafi.org.ph or www.facebook.com/rafi.org.ph. For more information about Gabii sa Kabilin and other programs of the RAFI-Culture and Heritage Unit, please call 418-7234 local 703 and look for May or Florencio. Q: What advise are the dos and donts for those who are joining this year’s Gabii sa Kabilin? A: Gabii sa Kabilin is not a race. Breathe in everything you see and slow down before you proceed to another. If you can’t finish all the sites, then there’s always the Gabii sa Kabilin the following year, another opportunity for you to visit the rest on your list. Besides, it’s not like the heritage sites will disappear after the Night of Heritage. They will be just where they are, begging for your attention and ready for your scrutiny on another day. Furthermore, dress comfortably, especially with your footwear; it’s best to wear rubber shoes or anything that’s lightweight as the tour requires a lot of movement. One of the activities I look forward to every year is Gabii sa Kabilin. How could I not when also, every year, new sites join in the festivity? Today the number has grown immensely–21, in fact. I’m also doubly excited to know more people are planning to be part of Gabii sa Kabilin, including my gang of 5. Gabii sa Kabilin 2012 is going to be grander, more festive, and thematic. 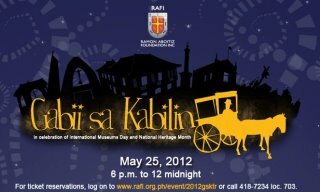 The Ramon Aboitiz Foundation Inc. (RAFI) Culture and Heritage Unit and its partners will hold the sixth run of Gabii sa Kabilin on May 25, 2012 from 6 p.m. to 12 midnight. For this year’s Gabii sa Kabilin, there are various suggested routes according to specific themes applicable to the museums and heritage sites, which guests can choose from. These themes include Museums; Art Galleries and Alternative Spaces; Heritage Structures; Educational; Churches, Temples, and Sacred Places; and Public Spaces. There’ll also be a walking tour along heritage sites that are within walking distance from each other. With one ticket worth PhP150.00, local and foreign tourists may go to as many participating museums and cultural heritage sites within the six hours of the heritage event. The ticket also allows them to take as many rides as they want in Gabii sa Kabilin-designated buses and one tartanilla (horse-drawn carriage) trip in Cebu City’s old district. May 2 is the official World Bloggers' Day. Spread the word! Though there are a lot of people these days who are trying to censor blogs and all types of media in the country, we still have a lot of freedom compared to journalists and bloggers in other countries such as China and the Middle East. Blogging is able to feed families and usher a more comfortable way of living without having one strapped to an 8-5 job. I can hardly count with my fingers the friends who are having the time of their lives through blogging. We get to express ourselves. I believe blogging has somehow changed Filipinos’ personality and sociability. They become more open and aware. They are slowly conquering their nerves and sharing their thoughts even in the most sensitive issues such as politics and religion. We’re finding our own definitive voice and place in the world. We harness the power of blogging for empowerment. When DOT’s It’s More Fun in the Philippines campaign rolled out, the world immediately took notice, thanks to the social media and blogging warriors. We cope with the sorrow and pain brought about by a long list of catastrophes through programs like One for Iligan, as well as words of encouragement and whispers of prayer through blogging and social media brigades. We sent the message to the world, “We need help!” and it reached thousands. When blogs published the alleged Photoshop photos of DPWH officials, it wasn’t really to mock them but to call attention and initiate change. Blogging is no longer just a hobby or a fad. It’s a passion shared by hundreds–professionals, students, moms, dads, PWDs, you name it. And to make sure everyone achieves growth and embraces it more tightly, groups such as Cebu Bloggers Society, Iligan Bloggers Society, and Manila Bloggers Society came about. We link the country to the world. World Bloggers Day brings together various bloggers and social media enthusiasts not only in the Philippines but also in other key cities and countries around the globe, such as New York, Singapore, Australia, Nepal, and Pakistan. Blogging has changed me in leaps and bounds. I gained new friends, learned to make myself open to criticism, and understood the importance of accountability. I discovered I don’t have to be a superhero, a politician, or a bigwig to be heard and influence people to be more proactive, take a stand, or learn more about himself and his environment. Today is the official World Bloggers’ Day, and I celebrate it by making every one of you know I’m certainly lucky and blessed to be blogging right here in my homeland. This year’s World Bloggers’ Day is sponsored by Diamond Suites Hotel and Tatt Awards by Globe.